It will take only a split second for any German to understand what about I am up to , reading the title of this article ..... it will also may not take much time for any sports enthusiast of Europe . But for most of others I think Herzogenaurach will be like Timbuktu !! Herzogenaurach is a small town in Bavaria, Germany. 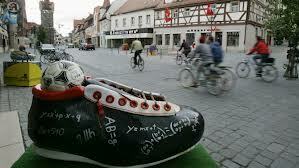 It is the birthplace of Adidas and Puma , two biggest global brands in sports goods. It could be difficult for any person anywhere in the modern world to spend any single day without using their products or at least coming across these two names ! Two brothers Adold Dassler and Rudolf Dassler started a small shoe making shop in 1920 . Primarily on hand sewn athletic foot wear. Adold was good in technical matters and Rudolf had special skills in marketing . Having put together their talents, they started doing well . The brothers employed 25 turning out 100 pairs of athletic shoes a day by 1927 . In 1928 Olympics ,the Dutch wore Dassler shoes and the sales took off further ! Their proud business moment together could be in 1936 Olympics , when American hero Jesse Owens won 4 gold medals wearing Dassler shoes ! 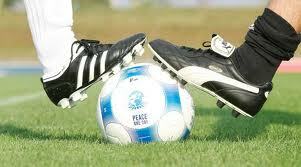 In the same Olympics the German team also wore Dassler shoes . In total 7 gold and 5 bronze medalists used Dassler shoes in the Olympics that year!! So far it went well . But soon the brothers started to have difference of opinions . For that matter, I think , in any partnership business , if the business flourishes each one thinks it is because his efforts are more, if it runs to losses and problems , each one thinks it is due to the partner's folly !! Apart from business it could be a similar situation in joint families as well . As days went by , the two brothers grew increasingly frustrated to each other .They disagreed on everything . Not only in business matters but even in personal matters . Each family including wives stood behind each one..The rivalry started working on the people of the village ! In 1940 Rudolf set up a rival shop across the river that flows through the town while Adold remained in the initial set up. Adold was pet named as ADI . He took out DAS of Dassler and formed ADIDAS as his brand name. The other brother considered RUDA but being a marketing man probably might have thought that it is not a saleable name , nobody knows about this. Instead selected a new name PUMA . Two brand names which later revolutionised the world of professional sports were thus born. It is equally interesting to know how they acquired the brand logos . While Puma straight away went for the animal as a logo , Three Stripes , which is the registered trademark of Adidas was purchased in 1949 from a Finnish sports brand named Karhu Sport for a paltry sum of Euro 1600 !! Slowly but steadily the impact of the rivalry between the brothers and families got into the nerves of the employees and then to residents of the town. The small town of Herzogenaurach was dived into two . On each side of the river that runs through it , people had separate lives to the extent each group with its own schools and restaurants ! They encouraged using different groceries and barbers ! One group will never go to a bar patronised by the other group!! Each business in the town was on each side .There was an Adidas butcher and a Puma butcher !! If one resident goes to one shop , then he or she was identified as in that camp. The employees of Adidas and Puma drank different brands of beer in different pubs! Intermarriage was not generally possible !! Employees of Adidas did not speak to those of Puma . Their children did not play each other. One local football club supported each brand!!! This reminds me of the (in)famous caption of an American President few years back who proclaimed " You are either with us or against us" , he told the world when he wanted to make an (mis)adventure with another country! Why America , we have still almost similar situation in Kerala state (India), my home state. Regardless of the best communal harmony existing there, when it comes to politics(only politics), the people behave differently . There is nothing wrong in having different political inclinations in a democratic country in fact it is better to have political awareness. 'Problem' with people of Kerala is that all have become 'prisoners' of different political ideology/parties and believe whatever introduced by their respective party is good and others bad ! Hence a development programme or new policy on industrial , commercial or any other related issues is good as long as ones own party launches it or will work against it if it is introduced by the opposite party !There are mainly two political groups in the state known as Left Democratic Front (LDF) and United Democratic Front (UDF) and they have been coming to power alternatively every 5 year !! While one front is communist centered, the other is capitalist oriented . Newspapers and other media , labour unions , students unions and even police are clearly divided when it comes to politics.One can see the swing in policies each 5 year people have to go through .Thankfully it is a division on political matters only and where ever they have common interests like Education, Literacy,Security , Culture ,Health, Social reforms, cleaner environments and others, Kerala is much ahead in India and at least in some cases on par with some of the developed countries .I am sure as Keralites will have more political maturity as years go, sooner than later , reflect in all development programmes as well in the state.However if the most literate state of India having a population of 33 million falls into this situation , I can fully believe what had happened to small town of Herzogenaurach which got mesmerised by Adidas and Puma. Let us get back to Dassler brothers. Jokingly it is said in those days, people of Herzogenaurach when they meet used to look at the shoes of the other is wearing? 'Town of bent necks ' it was nick named! Stiff competition , healthy or not that healthy , among the companies continued . I don't want to go into details of this because a book has to be written about it . I would cite two incidents the companies indulged so that the reader can appraise the situation . 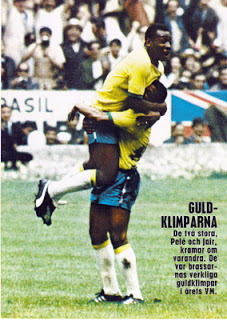 In 1970 FIFA world cup finals, Pele , the foot ball legendary stopped the referee with a last second request to tie his shoe laces and knelt down to give millions of viewers of TV across the world his branded shoes -Puma !! 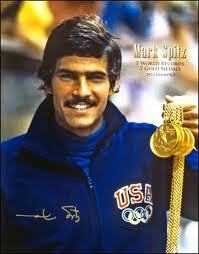 In 1972 Olympics , Mark Spitz , the American icon of swimming who got 7 golds, held up a pair of ADIDAS shoes as he waved to the crowd and viewers of the media across the world saw the moments. I am sure that most of the readers of this article may not be aware of 'multi million business' involved behind such ' simple gestures ' of popular players until now!! Both companies made a lot like Muhammad Ali, Franz Bekenbauer,Zinidne Zidane, Boris Bekker ....the list can be stretched quite long......as their ambassadors. The real reason of the fight between the brothers no one knows , although lot of stories are around .They took it to graves .Talking about their graves , it is in line with their lives .They are buried in the same cemetery but they are spaced as much as possible as they wished !! Horst, son of Adi and Armin , son of Rudolf and further generation took their inherited business to development of each company many folds , taking up the family feud also many folds . It is a known corporate secret that once a corporate identity is well established in the market, it is relatively easy to diversify into other ventures/products. The popular logos and existing supply chains can be used to launch products in the new arenas. That's why one can see the brand JAGUAR among perfumes,PORCHE in sun glasses, TATA in jewellery. It is for the same reason that one can find MANCHESTER UNITED cafe in Mumbai .The other day while I and Geetha were in a hyper market , we could notice mixed nuts- pistas, cashews, groundnut etc with strange brand names - FC REAL MADRID and FC BARCELONA!! Once known as sports wear brands , Adidas and Puma , ventured to dresses, watches, bags,sneakers, toiletries, fashion products, what not....Dozens of suits were filed and settled in courts world over to protect their brands including with WAL-MART and POLO RALPH LAUREN. They were so engrossed in their rivalry that they did not notice the entry of a common enemy from US getting into their market shares - Nike ! Rudolf's clan finally lost control of Puma in 1989 as Armin died of cancer. Horst had unexpectedly died in 1987. Adi's descendants lost Adidas in 1990. Now Puma is owned by majority French luxury goods maker PPR which makes products under GUCCI. Adidas is owned by a lot of small shareholders. Competition in business is acceptable but not rivalry .Fighting among kith and kin is not at all advisable ! In September 2009 , an attempt was made to heal the wounds of the bitter argument that split the town for 60 years . A friendly football match was conducted in the football pitch of the town finally to cool the heat among the residents nicknamed 'PEACE ONE DAY' . Although the ownerships changed the hands, the town has grown further along with the growth of the companies . The whole town could be still obsessed with the brothers' story to some extent but no enmity among the town folk as far as I know . Would the peace continue ? Yes, to make it sure we could have asked PAUL , THE OCTOPUS had he been alive.